(Scotiabank Field at Nat Bailey Stadium - Vancouver, BC) - The Vancouver Canadians and mascot Bob Brown Bear made a pair of community appearances on Saturday making stops in Burnaby and Richmond. Bob was ready to roll up his sleeves and help our friends at Developmental Disabilities Association as they celebrated Earth Day out at the Vancouver Regional Recycling Facility. Taking care of the environment is very important to Bob Brown Bear as he has help the Canadians install new energy efficient lighting out at Scotiabank Field at Nat Bailey Stadium. Did you know the Canadians will turn the lights off out at Scotiabank Field nine times this summer to help promote our BC Hydro Powersmart 'Nooners at The Nat. Talk about saving energy! 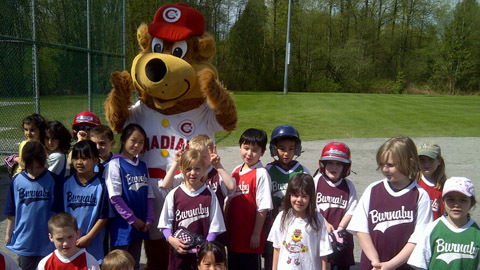 Shortly after helping out in Richmond, Bob zipped over to ring in another Opening Day, this time out on the diamond cheering hard for our pals within Burnaby Minor Softball Association. Softball (fastpitch) is one of Canada's fastest growing sports with more than 100,000 kids from coast-to-coast playing games that are just as competitive and enjoyable as baseball. The Vancouver Canadians open up the 2012 home schedule out at Scotiabank Field at Nat Bailey Stadium on Wednesday, June 20th at 7:05pm as the C's welcome the Tri-City Dust Devils in a re-match of last year's Northwest League Championship. Tickets to Canadians Baseball are available today by calling 604.872.5232, visiting the Nat Bailey Stadium Box Office at 4601 Ontario Street in Vancouver, BC or by scrolling to the top of this story and clicking on our many ticket options.